We are a leading Wholesale Trader of benzene-d6, cyclohexane-d12, acetonitrile-d3, acetic acid-d4, deuterium oxide and acetone-d6 from Vadodara, India. Benzene-d6 may be used as a 1H and 13C-NMR solvent.It may also be used for the synthesis of isotopically labeled samples and for the internal calibration of benzene stock solution during headspace-solid-phase microextraction. 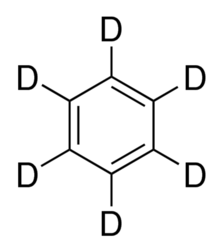 Benzene-d6 (C6D6) is a deuterated derivative of benzene. It is 100% isotopically enriched NMR (Nuclear Magnetic Resonance) solvent. It is widely employed in high resolution NMR studies due to its high chemical and isotopic purity. Its Soret coefficient S(T) has been measured by the transient holographic grating technique. Its first resonance Raman spectrum and infrared absorption intensities (in the range of 5000-450cm-1) have been reported. It participates in the synthesis of isotopically labeled samples. 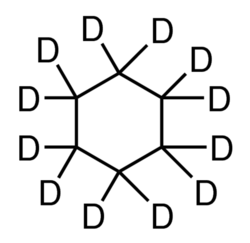 Cyclohexane-d12, a deuterated cyclohexane, is a standard purity solvent useful for routine NMR (Nuclear Magnetic Resonance) studies. Its infrared (vapor and liquid phase in the range of 376-4000cm-1) and Raman (liquid phase) spectral investigations have been reported. Ring inversion of cyclohexane-d12 has been studied by recording its deuterium NMR spectrum in the temperature range -36 to +115°C. It can be prepared by reacting benzene-d6 and deuterium. 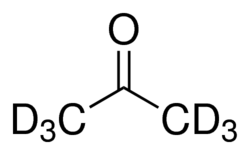 Acetic acid-d4 may be used in the synthesis of deuterated (7E,9Z)-CLA (conjugated linoleic acid) and Pr(CD3COO)3.D2O (. 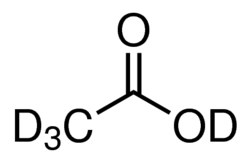 Acetic acid-d4 is a deuterated NMR solvent that is useful in NMR-based research and analyses. To prepare trifluoroacetic acid-d by reacting with trifluoroacetic anhydride. As a deuteration agent for primary and secondary alcohols at the β-carbon position via H/D exchange reaction in the presence of ruthenium catalyst. Along with hexamethyldisilane as a deuterium transfer reagent for alkynes to form (E)-1,2-dideuterioalkenes in the presence of a palladium complex. Deuterium oxide (D2O) is a 100% isotopically enriched NMR (Nuclear Magnetic Resonance) solvent. It is widely employed in high resolution NMR studies. Various thermodynamic properties (such as intermolecular vibrational frequencies, energy of the hydrogen bond, free energy, enthalpy and entropy) of liquid deuterium oxide have been evaluated.Ionization constant for D2O (in the range of 5-50°C), pK values (at 25°C) and enthalpy, entropy, heat capacity change (for the dissociation of D2O) have been reported. Acetone-d6 may be used as an internal standard to detect aldehydes and acetone in water by headspace-solid-phase microextraction and gas chromatography-mass spectrometry. Acetone-d6 is a deuterated NMR solvent useful in NMR-based research and analyses. Its Infrared and Raman spectra have been analyzed. Pyrolysis and photolysis of acetone-d6 and methane mixtures have been investigated as a function of temperature.It has been reported to be prepared by reacting heavy water with propyne-d4 in the presence of mercury catalyst. Dimethyl sulfoxide-d6 has been used as solvent for the dissolution of glucan during its proton, 13C (Carbon-13) and 2D NMR (Two-Dimensional Nuclear Magnetic Resonance) spectral studies.Dimethyl sulfoxide-d6 may be used as a solvent to study the nuclear magnetic resonance spectra(NMR) of the corresponding 1,3- benzoxazines and 1,3-benzoxazinones, which tend to possess antimicrobial activity. 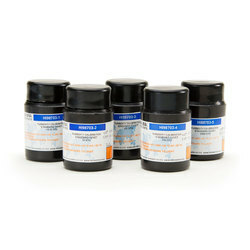 Dimethyl sulfoxide-d6 (DMSO-d6) is a deuterated solvent. It is 100% isotopically enriched NMR (Nuclear Magnetic Resonance) solvent. It is widely employed in high resolution NMR studies due to its high chemical and isotopic purity. On photoirradiation in the range of 193 and 222nm, it undergoes decomposition to afford CD3 radicals. Quantum yields of CD3 have been evaluated by infrared diode laser absorption spectroscopy. 100% DMSO-d6 has been used as solvent in the long-range COSY (Correlation Spectroscopy) experiment. 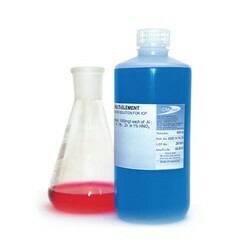 We are the one of a notable trader of high-quality ICP Standard Chemicals. These chemicals are processed using the best grade basic chemical substances with the help of advanced processing techniques under the utmost favorable condition. Clients can avail these chemicals from us in different packaging options as per their needs and the most reasonable rates.